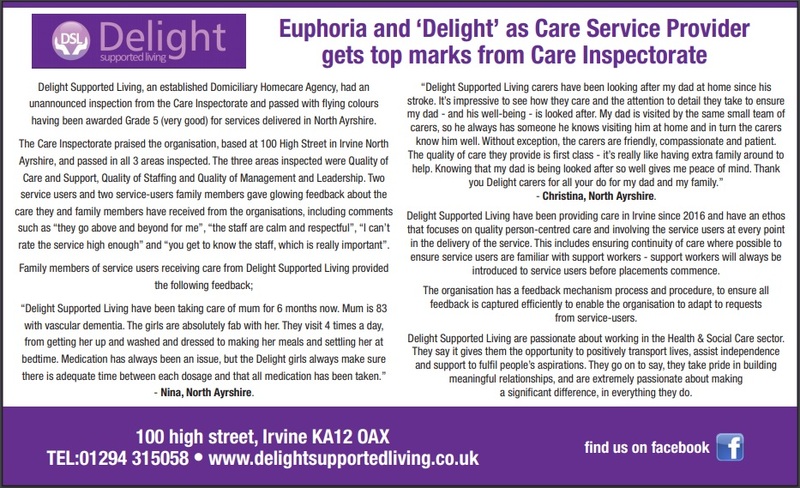 Delight Supported Living are proud to share with everyone an advert in relation to our recent inspection by the Care Inspectorate at our Irvine branch. Congratulations and well done to all of the team. Delight Supported Living are honoured and excited to announce that we have been invited to be a representative of The Parliamentary Review 2018/19. The Parliamentary Review gives organisations and individuals a platform to share knowledge, insight and best practice with peers, with a view to raising industry standards. Lesley Stewart (Head of Care Services) will represent Delight Supported Living at The Parliamentary Review. Delight Supported Living are passionate about working in the Health & Social Care sector. Daily, it gives us the opportunity to positively transport lives, assist independence and support to fulfil people’s aspirations. We take pride in building meaningful relationships, and we are extremely passionate about making a significant difference, in everything we do. Delight Supported Living Ltd has been awarded a place on the new National Clinical Staffing Framework for the NHS. Being awarded a place on Lot 1of the National Clinical Staffing Framework, developed for the NHS by the NHS Collaborative Procurement Partnership, means that Delight Supported Living Ltd can supply temporary staff to clinical positions in the NHS. Delight Supported Living Ltd successfully underwent an independent audit of our services and met the criteria for providing qualified clinical staff who can give high quality patient care at rates within the pay caps set by the government. These pay caps have been introduced to help the NHS control spiralling agency staffing costs.